Stabbed Panda Music is an underground music blog based in East Anglia, UK. Each month we release a variety of content including reviews of underground releases; music education resources via YouTube; interviews with musicians from our local indie scene to international touring artists. Excite.com takes pride in providing their customers the best of information, catering to a diverse audience and offering the most popular music tickets. Their list of the Top Music Blogs is designed to keep them up-to-date about the latest happenings in the world of music – from reviews, release or tour information, to stirrings in local music scenes. In early 2018, Excite.com included Stabbed Panda on their list of Top 20 Music Blogs. Excite.com’s list of Top 20 Music Blogs. We are delighted to be included in Scorebig’s Top 50 Music Blogs list, as of October 2017. Scorebig’s Top 50 Music Blogs List. Feedspot is a tool that let’s you keep track of what is going on in any given industry. Feedspot allows users to “pull” all relevant blogs and articles into a central place for their easy reading pleasure, saving time and allowing you to keep on top of what’s happening in your industry. Stabbed Panda became one of Feedspot’s Top 200 Music Blogs in October 2017. 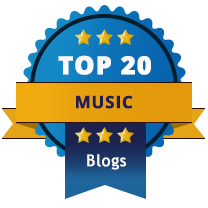 Feedspot’s Top 200 Music Blogs List.